When it comes to Git, SourceTree is definitely my tool of choice. 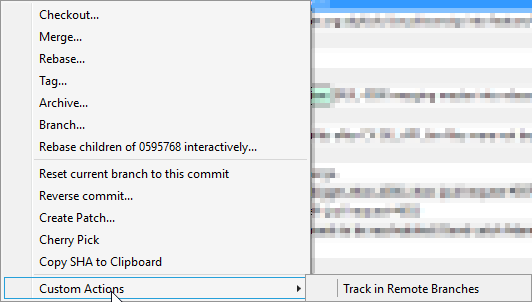 However, I was surprised to find that there doesn’t appear to be any sort of built-in commit tracking to see which branches do and don’t contain a commit, similar to changeset tracking in Visual Studio. Now, that said, it’s pretty easy to do with Git, there’s just nothing that I could find baked into the SourceTree UI (Am I wrong? Let me know!). The -r and -a parameters can be used to check just Remote or All (local+remote) branches. Now, SourceTree may not have this functionality built-in, but it can be added easily with a Custom Action. Here’s how you can create a custom action to track a commit across branches. With the custom action created, you can run it by right-clicking a commit and choosing Custom Actions > Track in Remote Branches. 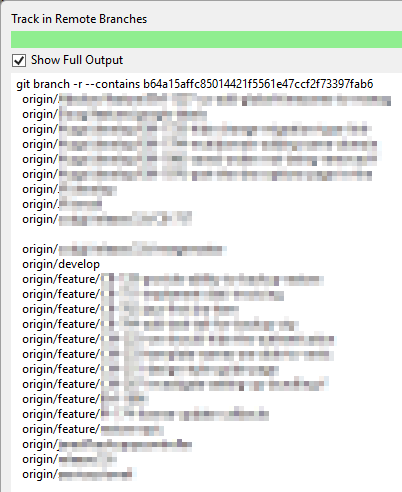 If you selected the option to show full output, the branches containing the commit will be listed in SourceTree.